After closing on a flat note in the week before this week, the current week saw the Markets ending with minor gains. On a week-to-week basis, NIFTY ended this week gaining 91.05 points or 0.86%. In our previous Weekly note, we had mentioned about formation of a probable lower top. This formation still remains the resistance area for the Markets in the coming days. As we step into the coming week, we face an important economic event of RBI Credit Policy slated to come out on June 06. Apart from this, we do not see any major triggers for the Markets and do not expect a run-away rally in the Markets in the coming week. The falling trading line that has emerged out of the formation of a lower top is likely to resist any significant up move that the Markets may attempt. Coming week will see the levels of 10790 and 10865 playing out as immediate resistance area for the Markets. Supports come in lower at 10610 and 10515 zones. The range remains wider this week on either side. The Weekly Relative Strength Index – RSI stands at 57.7511 and it remains neutral showing no divergence against the price. Weekly MACD stays bullish while trading above its signal line. No significant observations were seen on Candles. If we look at pattern analysis, after forming a lifetime high of 11171, the NIFTY has formed a lower top at 10930. This emergence of a lower top has resulted into formation of a falling trend line joining these two levels. In the coming week, this will pose resistance to the Markets in event of any attempted up move. 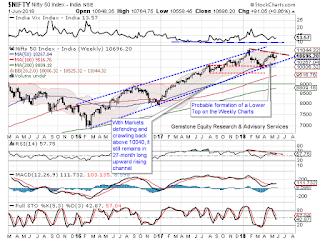 Overall, despite the likelihood that the NIFTY may not witness any runaway up move beyond a point, it still remains very much in the 28-month long upward rising channel. The coming week is likely to continue to remain extremely stock specific in nature. We recommend spotting smart buying opportunities that any corrective move may offer and at the same time, continue to protect profits at higher levels. A study of Relative Rotation Graphs – shows that the coming week will see Financial Services stocks continuing to relatively outperform the general Markets. They are likely to be accompanied by FMCG Stocks who still remain in the leading quadrant but are seen slowing down a bit. Apart from this, we expect PSU Banks and components of Bank NIFTY attempting to improve their relative momentum as well. 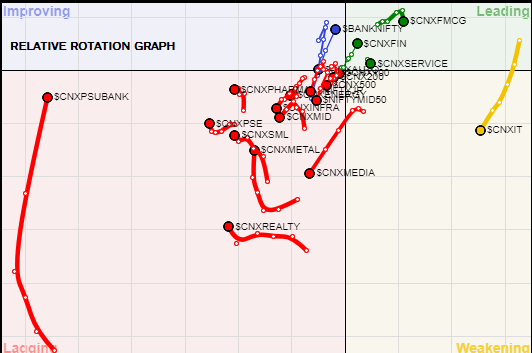 Apart from this some isolated and sporadic out-performance are a expected from METALS, Public Sector Enterprises and Realty pack. 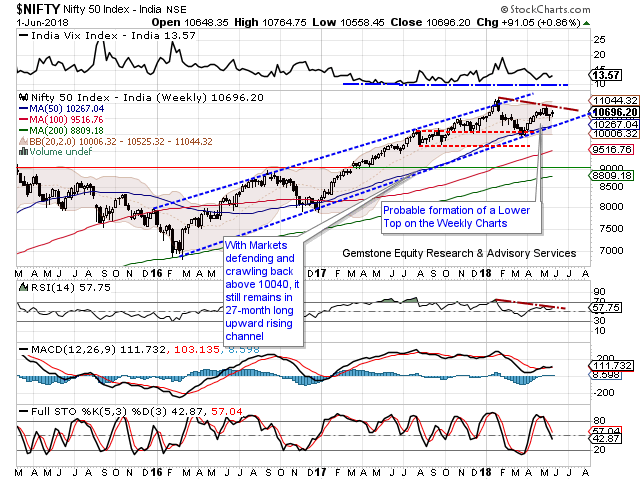 We do not expect any significant out-performance from the broader Markets as all broader Indices like MIDCAPS, CNX100, CNX200 and CNX500 are seen deteriorating on the momentum front. Auto stocks too are not expected to put up any significant show on a weekly note.